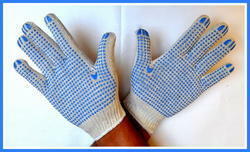 Dotted Safety Hand Glovesavailable with us, is an extensive variety ofPolka Dotted Hand Gloves .PVC Dotted gloves are machine knit seamless gloves available with anti-slip DOTS in 7,10,13,15 gauge made of cotton/ Nylon and blended knitting yarns. PVC dots provide extra gripping power and slip resistance. Due to PVC Dots the durability of DOTTED gloves is higher than the plain seamless knitted gloves.Owing to the quality features, our offered products are in high demand in the market. 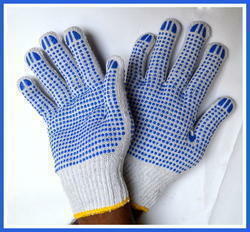 We are able to offer a wide gamut of Polka dotted cotton knitted hand gloves. These are offered in different colors, shapes and sizes and can also be customized as per the requirement. 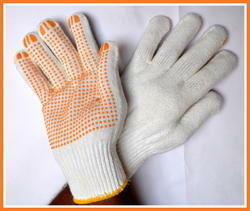 The entire range of Polka Dotted Cotton Knitted Hand Gloves is strictly quality tested on the basis of industry set quality parameters and norms.Available with us, is an extensive variety ofPolka Dotted Hand Gloves .PVC Dotted gloves are machine knit seamless gloves available with anti-slip DOTS in 7,10,13,15 gauge made of cotton/ Nylon and blended knitting yarns. PVC dots provide extra gripping power and slip resistance.Due to PVC Dots the durability of DOTTED gloves is higher than the plain seamless knitted gloves.Owing to the quality features, our offered products are in high demand in the market. 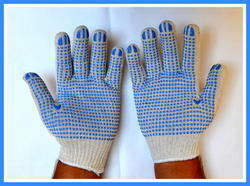 Dotted Hand Gloves100% cotton seamless knitted fabrics withone side PVC dots Elastic wrist 6 cm.Cloth color cream and dotted color blue. Leveraging on our latest infrastructure facilities, we are able to offer a wide gamut of Polka dotted cotton knitted hand gloves. These are offered in different colors, shapes and sizes and can also be customized as per the requirement. 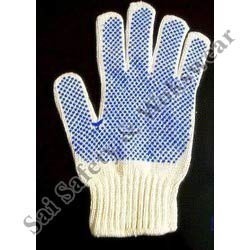 The entire range of Polka Dotted Cotton Knitted Hand Gloves is strictly quality tested on the basis of industry set quality parameters and norms. Backed by a skilled team of professionals, we are able to offer our valued clients with PVC Dotted Hand Gloves. Developed and designed with latest technology, these products are highly durable and easy to wear. These products are thoroughly tested to ensure flawlessness and perfect finish. Furthermore, to cater to the needs of our valued clients, we are keen to offer these products in diverse sizes and specifications. Owing to the expertise of our experienced professionals, we are able to offer our clients with a precisely engineered gamut of Polka Dotted Cotton Gloves that is widely used in construction and industrial applications. These cotton gloves are designed and manufactured with high precision using the finest quality cotton fabric under the stern guidance of our talented professionals. 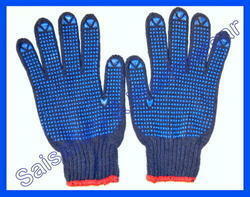 In addition to this, we also provide these cotton gloves at highly competitive prices to the clients. These gloves are Both side polka dotted . That is on palm and as well as back of hand . As they are both side dotted they give extra protection to our hand from palm side as well as back. 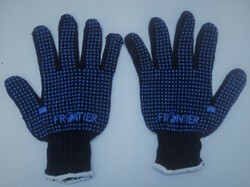 than one side dotted gloves.